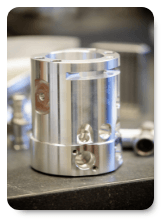 Kovacs Machine & Tool Co. is a full‐service machining company that is solely owned and operated by three industry experts: Allen Cuccaro, Michael Frank, and, Peter Albrycht. Collectively, they have more than 100 years combined experience in Product Development, Product Design, CNC Machining, Business Operations, Plant Operations, and Quality Assurance. Together, Allen, Michael, and Peter purchased the company in 1987. Since that time, and with some of the best employees in the industry, they have increased capacity, maintained, and continue to build a fiercely loyal customer base. Their experience, ingenuity, commitment to quality, and service has been recognized time and time again. Kovacs Machine & Tool Co. serves a broad range of customers who come to us with an even broader range of challenges to solve. After all, solving problems and customer service is what sets us apart. We are passionate about quality and take great pride in services that Kovacs provides for its customers. Kovacs Machine & Tool Co. wants to be your manufacturing partner who will bring value and quality to your products. Our impeccable service, attention to detail, advanced technologies, and competitive pricing will help you bring products to market quickly and cost-effectively.